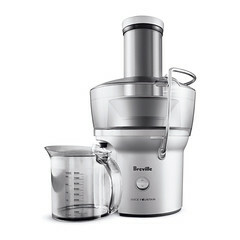 The Breville Juice Fountain® Compact — This compact design is packed with power, delivering all the power and performance you’d expect from a Breville juicer. The 700 watt motor spins the filter basket at 14,000 RPM to extract 8 oz (250 ml) of juice in a mere 5 seconds. Collects pulp within the footprint of the unit to conserve counter space. A. Food Pusher - for pushing whole fruit and vegetables down the patented wide feed chute. B. Uniqe Patented Centrally Located Feed Chute - ensures maximum juice extraction and fits whole fruit and vegetables. C. Nutri Disc™ - stainless steel micro mesh filter basket designed for optimum juice and nutriend extraction. D. Juice Jug Lid - allows juicer to operate with the lid on, therefore eliminating any splatter during operation. 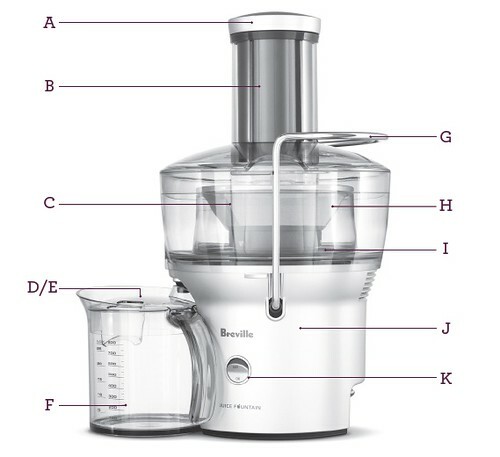 E. Built-in Froth Separator in Lid - ensures juice froth is separated from juice when poured into a glass. F. 800ml Juice Jug - dishwasher safe on the top shelf only. G. Safety Locking Arm - juicer will not operate without juicer cover in place and safety locking arm locked into place over the juicer cover. H. Juicer Cover - dishwasher safe on the top shelf only. I. Integrated Pulp Container - will collect pulp for up to 1.5 liters of apple juice. J. High Performance 700 Watt Motor. K. Easy ON/OFF button. L. Not Shown - Cord Wrap - cord wraps around a raised disc in the base of the Juicer. M. Not Shown Spatula - style end of brush is to assist in the removal of pulp from the Integrated Pulp Container when juicing large quantities. N. Not Shown Nylon Bristle Brush - Included for easy cleaning of the micro mesh Nutri Disc™.